You have to see this to believe it! Stuffed bears on the walls, birds hanging from the ceiling, animal murals on the walls, guns and power shot bows (had no idea what those were–high powered bow and arrow!). 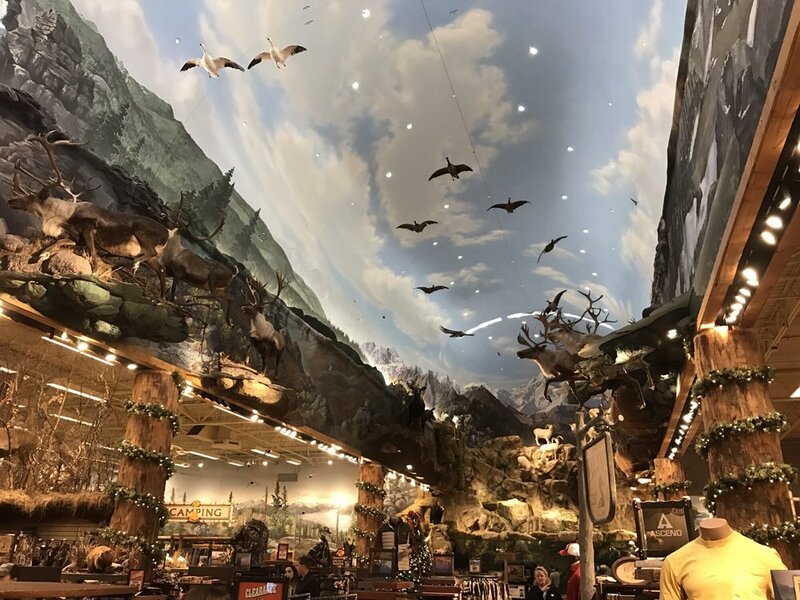 Imagine the Kipling Jungle Book Alaskan style: This is The Bass Pro Shop in Anchorage, Alaska. 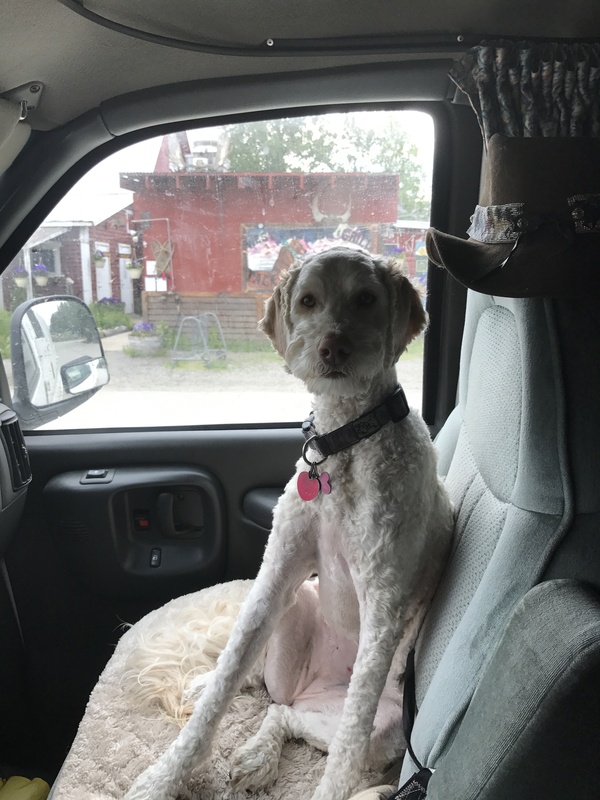 We stopped in the Anchorage area for two days to stock up on supplies (thank you CostCo), get a few camping things (thank you Pro Shop) and get Alice shaved since she had her “Rastafarian, Bob Marley look.” (She hated me that day.) The campground in Palmer, a 40 minute drive to Anchorage, had electric & water which is always a treat. Palmer is also 10 minutes from Wasilla, Sarah Palin country. We did not stop to say hello. 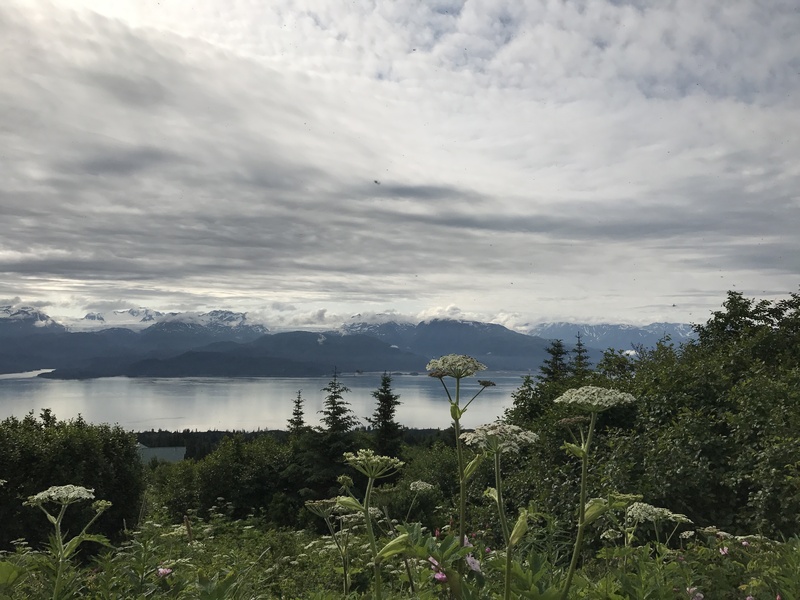 The Kenai Peninsula south of Anchorage is a mecca for fishermen and kayakers, hikers, bicyclists and campers. The rivers, full and gushing, asked to be ridden. Locals and tourists used the bike and hiking paths along the roads. I saw RVs and trucks pass me with bicycles in front and kayaks either on top or on a trailer. The roads wove through pines, spruce, aspen and birch trees. It went around lakes and glaciers, up mountains and down valleys. Periodic stops off the road at small kiosks all with one thing in common, ESPRESSO signs, and walks with Alice kept my mind clear, well as clear as it can get, and kept my legs stretched. We stayed at campgrounds by streams or by boat launch areas. The license plates reflected the diversity of people: Alaskans to Virginians and states and Canadian provinces in between. 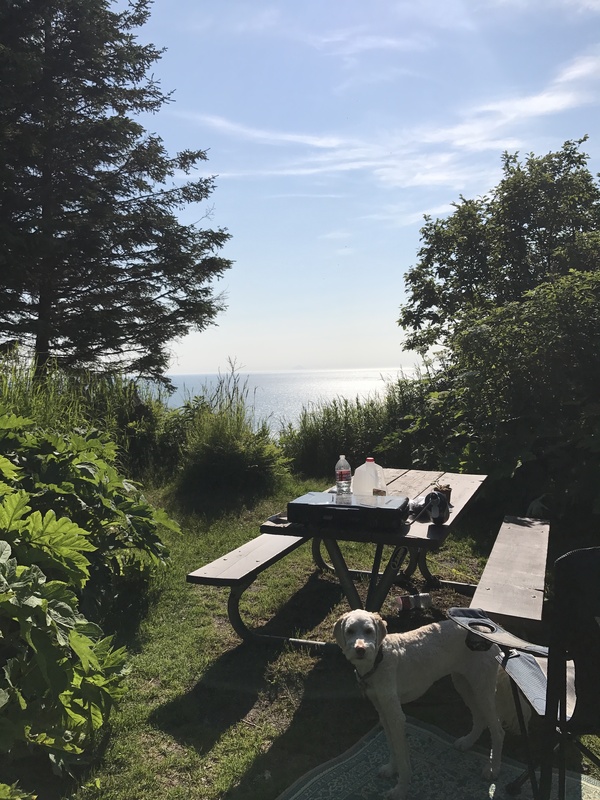 I found a camping spot, which overlooked the ocean outside of Homer, a small town on the tip of the peninsula. It was idyllic. Peace overtook me with cool nights and bare arms during the day. 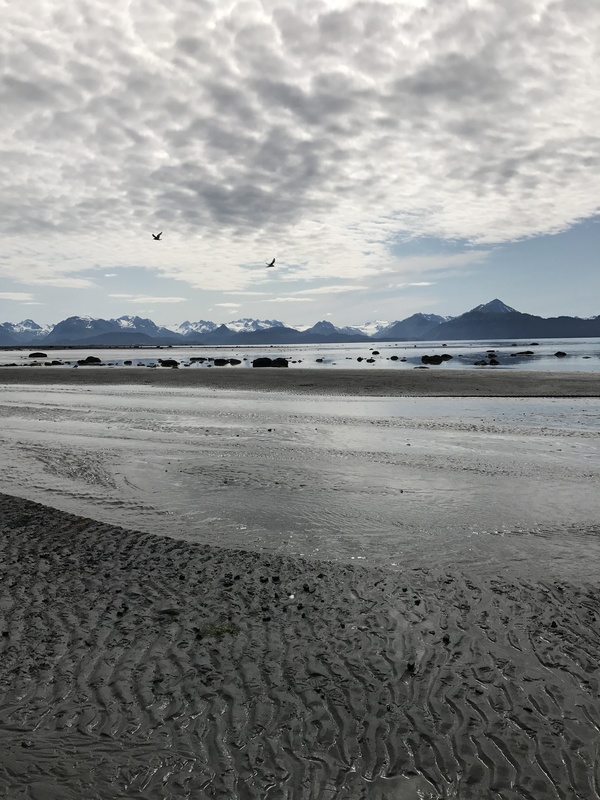 Alice and I were not as industrious as the kayakers, instead and we walked on the beach in Homer, which reminded me of Oregon with those long stretches of sand but with glaciers and mountains on the other side of the sea. As I meandered and struck up conversations with others, the dog ran and ran constantly chasing the birds, always ending up looking up at them fly away. I met a couple who were stationed in Alaska and upon retirement moved down to Homer – they wouldn’t live any place else, they told me. It is a community oriented town with art programs, book groups, art walks and a GREAT THAI RESTAURANT, I might add! 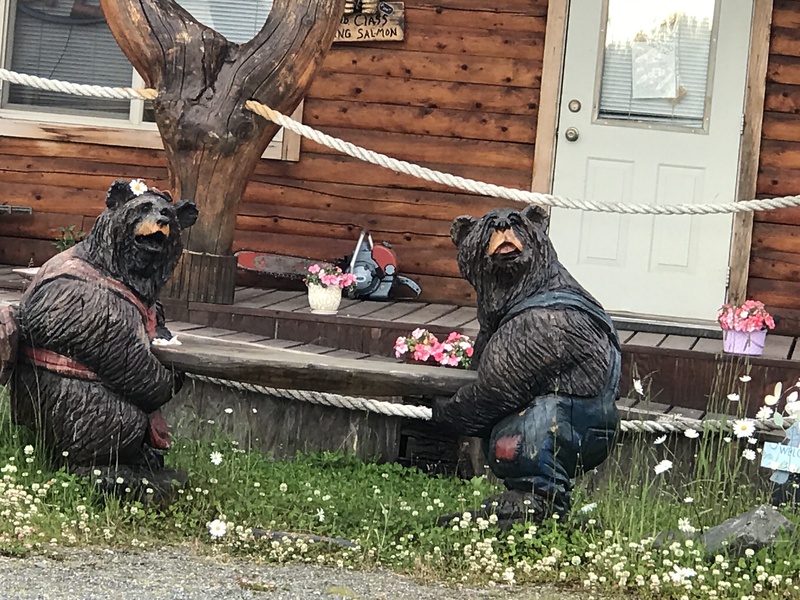 For three days, we saw the sights of Homer and surrounding areas, and some sadness struck when I decided to move on. It was so comfortable there, reminded me a bit of Taos with the variety of people and the transience of their lives. 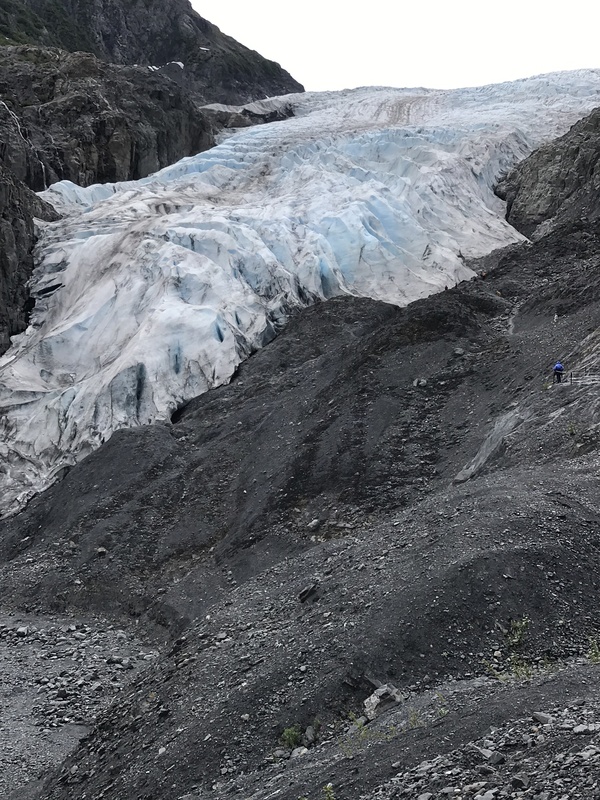 Glaciers engulfed us on our way back up since I made a point of stopping at them, taking hikes to see their retreating coverage. Our world is changing, and what a gift it was to see these magnificent works of nature. We also did a few trail hikes, but only if I there were a few cars parked at the trailhead. I figured if I was mauled by a bear, at least someone would find me or parts thereof! I did stop at the Moose Bar in the town of Moose Pass with a population of 97 before I left the Peninsula. You know how you are just dying to eat a certain thing? I was dying for a really good hamburger(!!) amidst all this fish! I sampled the local beer – love the label. 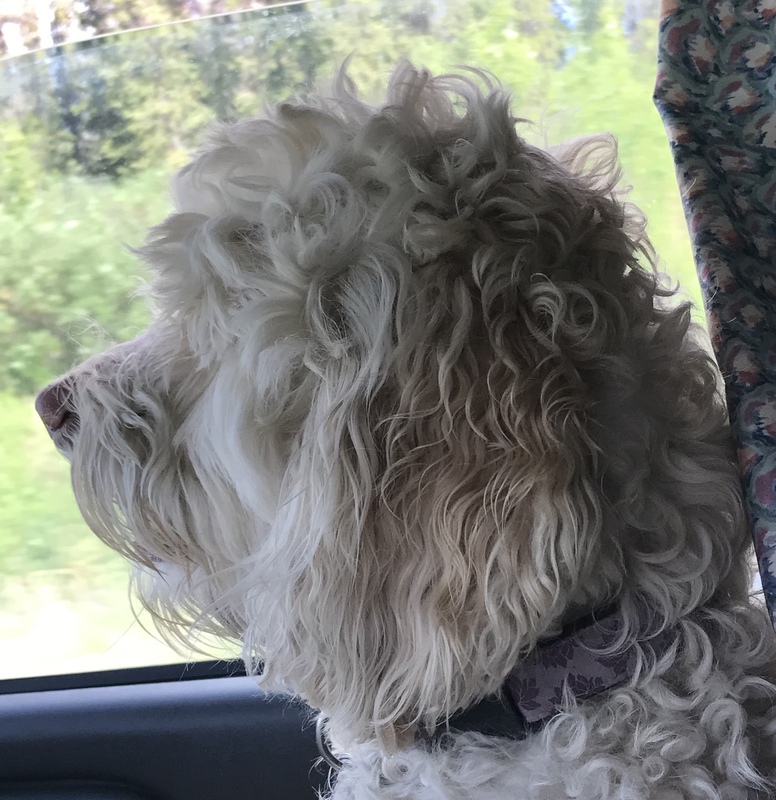 Alice: Just a quick note here, I would like to share with you what I saw while looking out the passenger window on this drive. My only comment is: There is absolutely no accounting for taste. So on that note, Alice and I say good bye.. and on to Denali and the Top of World Highway that led us to Dawson City and Klondike Region! Take good care! 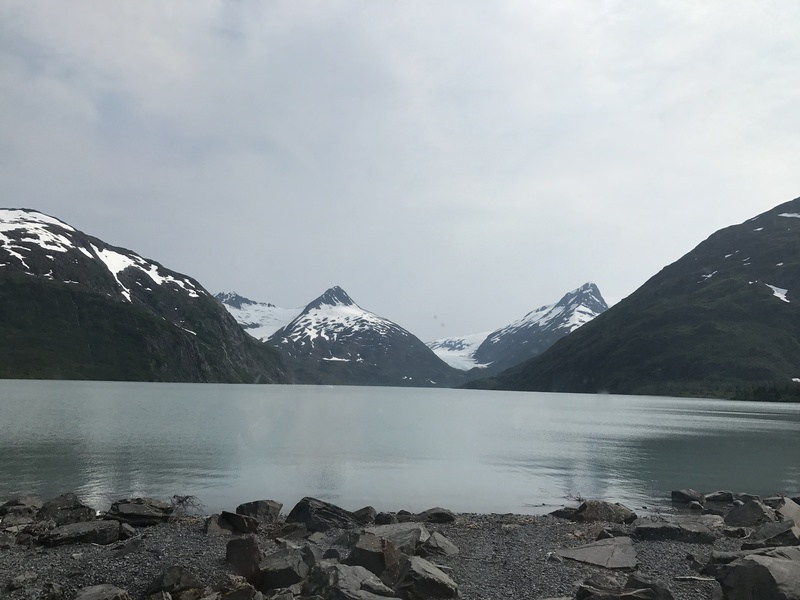 Pretty fabulous scenery and experiences Lisa, glad you are enjoying one of the few states with such scenery…….much like BC in many ways. Good to hear from you as well (our honeymoon buddy from ’95). Cheers dear, Jim and Lin. Jim, Jim.. can you believe 22 years have gone by since I was walking on the beach in Puerto Vallarta and you all were eating lunch?? Plan on driving down the Nayarit coast in late Jan.. have a friend from France who spends his time in Bucerias during Feb… so.. anyway, hope we connect down there and perhaps park in your parking lot!!! Would be so nice to connect after so many years.. my hugs to you and Lin! Pretty unreal this entire journey. Yes, I consider this journey a true gift in my life. Hope all is well, Shelli! Homer was your reward for all the lonely miles yo have traveled. Thank you, for sharing. Thanks for following my journey, Heidi.. hugs to you & Trent! Hey Alice, I gotta agree with you!! 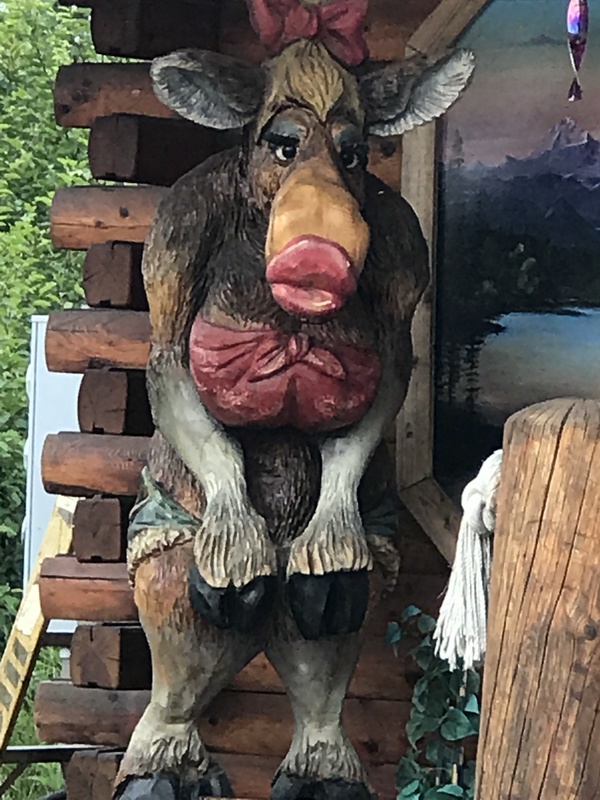 Whats up with dressing up that moose?